I have gotten very involved with sewing for others lately (charity projects, classroom samples, bee projects, kid's clothes, etc.) and sometimes, damn it, I just need to make something for myself. I bought this linen last summer and finally talked myself into cutting out a skirt. It is a simple skirt from The Essential A-line by Jona Giammalva. I really love just the basic pattern, 2 darts, 1 invisible zipper, lined--all that I need. I received nice feedback on Facebook and Instagram when I showed my new piece. I made another a few days later, I'll share soon! That dangling thread is probably in a bird's nest now. 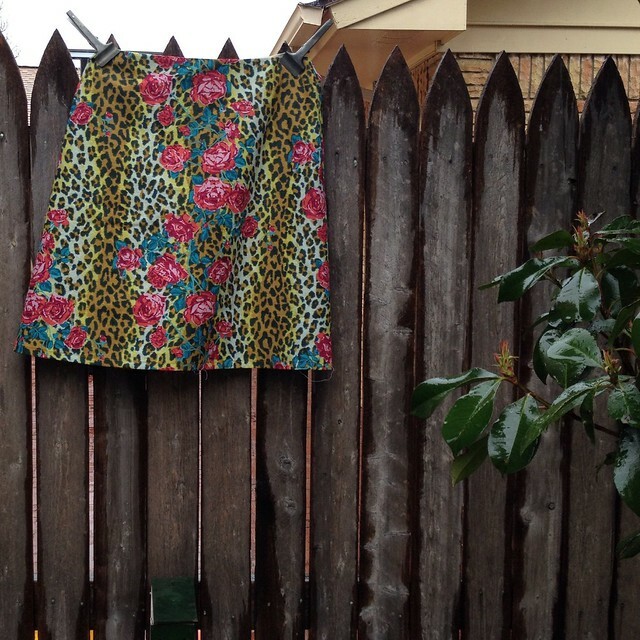 Have you heard of Modern Sewciety Podcast? It is run by Stephanie K., she interviews people in the sewing/quilting industry and has great guests on her show. Susannah and I recently spoke with her about our upcoming sewing retreat, Sew OK (spots still available). It was easy to converse with Stephanie, we even talked more after our episode ended and we are still discussing stuff! 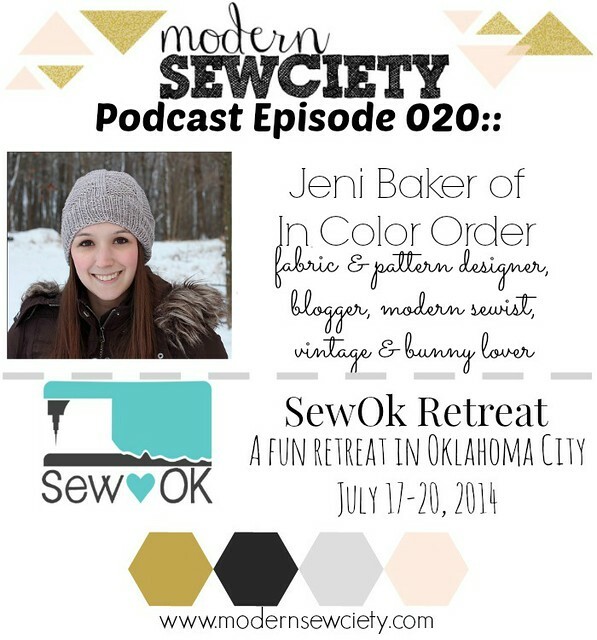 If you like podcasts, give it a listen, we share an episode with the ever-so-cute Jeni Baker! I finally finished all four of the tunics for the little, I cut them out in November thinking that I could work on them post wisdom teeth extraction--INCORRECT. After that week of inactivity, it was the holiday season and I had to put them aside. I buckled down and got to work on them at home and was determined to let her wear a size 7 while she still can, even though she just turned 7. She has a pair of jeans to wear for about another month, but, I think that a straight skirt or shorts will look good with the tops, too. I love this pattern, I made a few dresses for her from the Geranium dress pattern last year, it's a hit! All four of these button in the back, one has flutter sleeves, 2 are pleated, the other 2 are ruffled at the skirt, I like pleating better because I can knock it out so fast! Oh yeah, I HAVE A DOG. 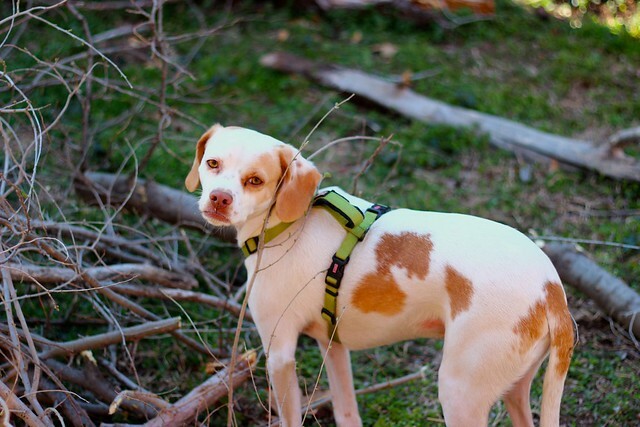 This guy was outside with us while taking pictures and he ate tree branches like they were chew toys, oh, that dog of mine! 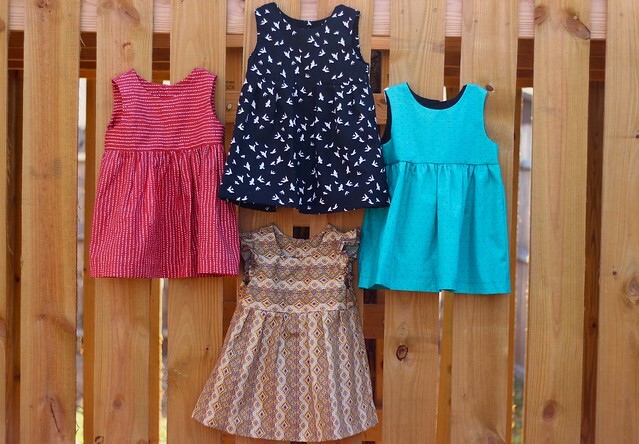 You can find the pattern for the Geranium Dress at Made by Rae. It's almost been a year since QuiltCon, I don't think I blogged about it all, when I do stuff like that, I live to the max & am just DONE when I come home. I had a great time--too much fun really (there's a limit on wine & seam ripper alcoholic beverages, I've learned). Yikes. One of the classes that I had was Get Your Curve On by Sherri Lynn Wood, this was the one class that I had to have, I am still so happy that I was able to enroll in it. Sherri was a great instructor, I enjoyed this class and technique so much, I found her way to be soothing and not chaotic and it is much appreciated. I prefer not to give away the structure because you should take a class from her should you ever find yourself in the vicinity of Sherri. Now that the top is tackled, I need to figure out quilting, I think I will hand quilt this, I need a new project to take to dance & gymnastics. Do you have any quilting suggestions? I mean, I'm probably not going to do it, but, you never know. 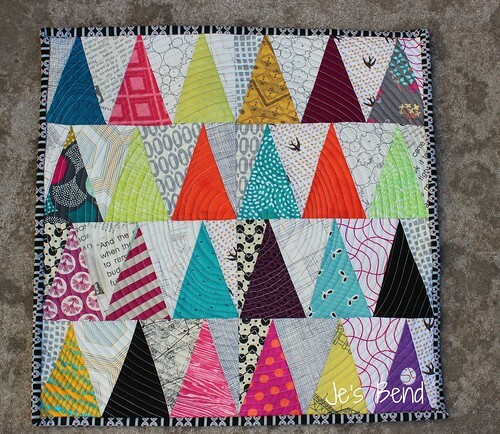 A few of OKCMQG members and myself are participating in a challenge for 2014, we will be making our own quilt from the book Tula Pink's City Sampler: 100 Modern Quilt Blocks. Our (my) plan is for us to sew together once a month to see our progress throughout the year, in order to attempt to finish by year's end, we need to make 11 blocks each month if all 100 blocks are needed. I decided to do a green quilt, I've never done a monochromatic quilt before, I hope this is a good decision. I do love green and couldn't decide between it or blue (I have more blue fabric). I will post updates as I work on this project. Go, green! I made one block so far (it was a sew day & one member sewed with me). A sweet artist asked me to make 3 quilts for some young ones in her life, they are siblings and wanted to give them quilts for Christmas. I went back and forth on what I would do for their quilts and finally stuck to a plan to use the same fabrics for the brothers with different blocks. My intent was to make a wonky churn dash, but I didn't cut out (or even think about) the other set of bars around the square, OH WELL. These 2 quilts have wool batting, doesn't it looks so fluffy and warm? Here is the sister's quilt, I used the St. Louis 16-patch block, it makes a quick and substantial quilt. Christie said that the quilts were a hit! That makes me happy because I am always nervous to hand over my work, especially when it's commission. I'm grateful for the opportunity to make things for others, but, damn, I sure get the sweats during those final moments. Speaking of commission work, I can't remember if I have posted about Sam Hunter's series on placing value on your work, but, here it is: We Are $ew Worth It. We are worth it, our time is worth it. Sew, Mama, Sew also has an article about the subject, read it, live it. I have a few bee blocks to make and I need to finish my Shirts Swap blocks, I do them with a beer, it's always a fun time. In the post before this, I shared the quilt that I made for the Doll Quilt Swap #14. Anna (woollykat) loves her mini & I am so relieved! She does great work & I'm a fan. This is the mini quilt that I received, it was made by Laura VanVleet & it is a striking piece! I love the colors & design of the blocks! She sent some fun scissors (yay!) & cute bird magnets (sorry, no pic). I'm pretty vague on swap questionnaires, so she did a fantastic job with few details. Thank you, Laura! Feb 12, 2014 6:41:54 AM | Quilts, Thanks! I signed up (at the last minute) to be in Doll Quilt Swap 14 on Flickr. I like swaps and on-line groups, I love bouncing around and meeting new people. I don't like the pressure I put on myself to make things for strangers, though. I got lucky, I am a fan of my partner and she was good about describing things that she likes. I'm not sure if I nailed it or missed the mark, but, I do like the way that this mini quilt ended. I used one of the templates from Carolyn Friedlander's Tangelo quilt pattern, so, it is paper pieced. I kept skipping steps in the first block that I made, picking out paper pieced stitches is tedious as hell, once I got in a groove, it was smooth sailing! I did not put too much thought in the arrangement of the fabrics and it put me at ease, it's so easy to stare and pick apart my work. I quilted this mini in a spiral, Amanda Jean has a great tutorial on this technique. My quilting started with free-motion (a little wonky) and ended with a regular sewing foot, it took over an hour to quilt this. It takes me an hour to quilt baby quilts with less stunning results--noted. I photographed this with the binding pinned (once I finish something, I'm ready to get it out of my hands), but, it was hand-stitched. I will update this post with the label that I've been using for quilts later. 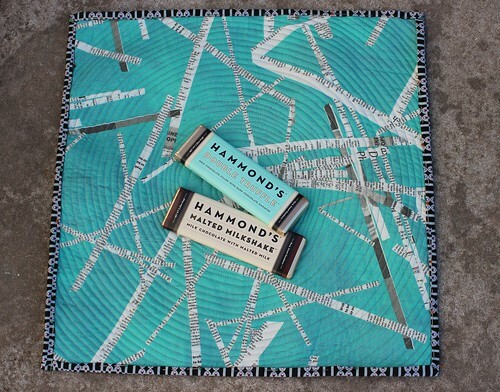 I also sent Hammond's chocolate bars to my swap partner, I think anyone who enjoys chocolate will like these. Have you had Hammond's before? These 2 are delicious and the red velvet is surprisingly good, too! I am very busy with going back to my studio and getting Sew OK stuff done, there are still spots available, so, go ahead and register, why don't you? 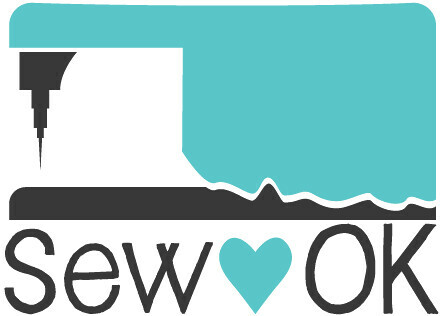 We announced our teachers yesterday and Sew OK registration opens today!